Dr. Jonathan Whitaker joined the faculty of the University of Alabama in the fall of 2009. At Alabama, Whitaker’s students have been tremendously successful in national and international solo competitions including the Eastern Trombone Workshop National Solo Competition, the International Trombone Association’s solo competitions and the Alessi Seminar. The University of Alabama Trombone Choir has given performances at the 2010 Eastern Trombone Workshop, the 2011 International Trombone Festival in Nashville, TN and the 2013 International Trombone Festival in Columbus, GA. Whitaker has also appeared as a performer and clinician at the Eastern Trombone Workshop twice and two International Trombone Festivals. Whitaker is in great demand as a guest artist and has appeared at some of the most prestigious music schools in the country including The Juilliard School, New England Conservatory, Yale University, Indiana University and many more. As a soloist, Whitaker can be heard on numerous recordings including the 2013 release of his debut solo recording entitled “Nature’s Gift” with pianist Kevin Chance. He is a featured soloist on two recordings with the University of Alabama Wind Ensemble that include Anthony Barfield’s “Red Sky” and David Maslanka’s Concerto for Trombone and Wind Ensemble. These recordings are available at www.jonathanwhitaker.com. In 2013, Whitaker gave the world premiere of James Stephenson’s Three Bones Concerto commissioned for the University of Alabama Wind Ensemble along with Joseph Alessi and Peter Ellefson. He also performed the work at the 2013 Eastern Trombone Workshop with the United States Army Band “The Pershing’s Own”, again with Alessi and Ellefson. In 2012, Whitaker made his Carnegie Hall debut as a soloist at the New York Wind Band Festival. He has appeared as a soloist with all of the wind groups at Indiana University, the Augustana College Symphonic Band, the Purdue University Symphony Orchestra, the Henderson State University Wind Ensemble and performed a premier performance of John Mackey’s Harvest: Concerto for Trombone with the University of Alabama Wind Ensemble in the fall of 2010. He also performed the American premier of Johan de Meij’s T-Bone Concerto with the Murray State University Symphonic Wind Ensemble. Whitaker has performed with the New York Philharmonic on two separate occasions. In 2012, he performed on the orchestra’s Opening Gala that was broadcast on Live from Lincoln Center on PBS with music director Alan Gilbert. In 2011, he performed on concerts featuring Bartok’s Bluebeard’s Castle with Esa-Pekka Salonen conducting. 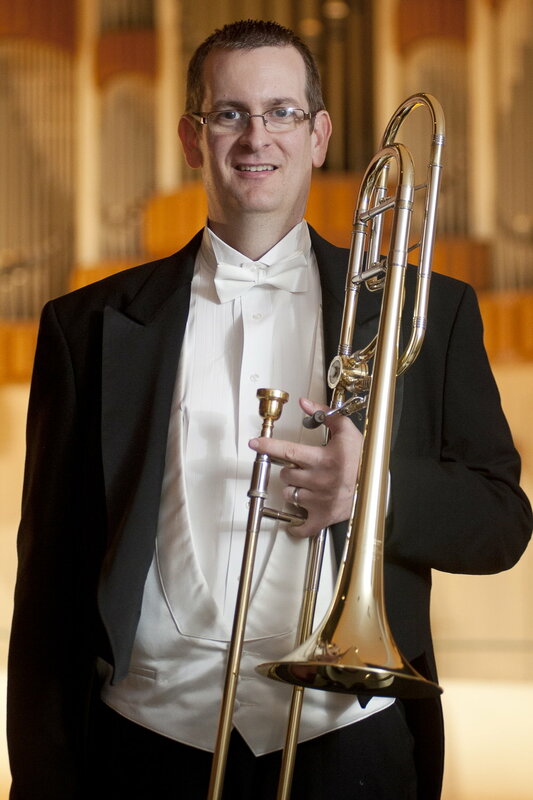 Whitaker is currently Principal Trombone of the Tuscaloosa Symphony Orchestra. He performs regularly with the Alabama Symphony, Harrisburg Symphony (PA), Mobile Symphony (AL) and has also held positions and performed with the Arkansas Symphony, Pine Bluff Symphony (AR), Shreveport Symphony (LA), South Arkansas Symphony, Duluth-Superior Symphony (MN), Owensboro Symphony (KY), Evansville Philharmonic (IN), Richmond Symphony (IN), Jackson Symphony (TN) and the Paducah Symphony (KY). As a chamber musician, Whitaker can be heard on Dee Stewart’s CD entitled D+ (Dee Plus) performing with the Indiana University Trombone Faculty and on two recordings by the Stentorian Consort Trombone Quartet. Whitaker serves on the faculty of the Alessi Seminar. In 2005, he was selected as one of sixteen participants for the Seminar and was a featured soloist twice that year. From 2005-2013, Whitaker served as the chief administrator for the Seminar and is honored to now be on the faculty. Dr. Whitaker holds degrees in trombone performance from Murray State University and the University of Minnesota and the Doctor of Music degree in Brass Pedagogy from Indiana University where he served as Associate Instructor of Trombone from 2001-2004. Dr. Whitaker’s primary teachers include Ray Conklin, Tom Ashworth, M. Dee Stewart, Peter Ellefson and Joseph Alessi with additional studies with Arnold Jacobs, Edward Kleinhammer, Michael Mulcahy, Charlie Vernon and Douglas Wright.